Can Laser Hair Removal Really Get Rid of My Unwanted Hair? In 2016, it’s almost impossible not to know or have talked to someone who’s had laser hair removal somewhere on their body. It’s a very popular procedure and there are all kinds of providers, medical and otherwise, offering laser hair removal now. It seems like anyone can get it done almost anywhere! But maybe, you’re someone who’s skeptical of laser hair removal? Maybe you’ve thought about it, but don’t know if it really works or who is the best at doing it? Why is there such a wide price range, and why does it take so many treatments? If this sounds like you, then you’re on the right page! We can help answer all of these questions and more. At Celibre Medical, we want you to know as much about the process of laser hair removal as we do (well, almost anyways!). Did you know that at any given time, you have a certain percentage of hair on your body that is about to fall out or not growing at all? Yes, it’s common knowledge that we shed hair everyday, but why is that? And it’s not just true for the hair on our scalp, but also that in our underarms, legs and everywhere else! It’s because our hair grows in cycles. Each hair follicle has a “lifespan” that consists of three phases: anagen, catagen and telogen phase. If you look at a “snapshot” of our hair on any given day, a majority of it is in anagen or “growth” phase. This is why our hair grows longer with time. It’s during this phase, that our hair responds best to laser hair removal. Anagen phase can last years for hair on the scalp, but thank goodness it only lasts weeks on our bodies (or we’d all look like Sasquatch!). At the end of anagen, our follicles go through catagen phase. 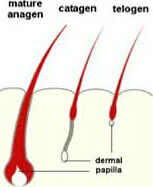 During this phase, the blood supply of the follicle diminishes and the growth stops. Catagen lasts about 2-3 weeks. The hair is getting ready to fall out and be replaced by a new one. Telogen is the phase of the follicle where the hair falls out! There’s nothing in the follicle at all. If we go back to our “snapshot” of our hair on any given day, about 10-15% of our follicles are in this phase. So why are we giving you this biology lesson? Because it answers the question of why you need multiple laser hair removal treatments to effectively get rid of your hair. If you only did it once, you’d only be treating a percentage of hair you want to get rid of, as not all of your hair is growing (in anagen phase) at once. If the person treating you doesn’t understand this, he or she may not plan for enough sessions to actually give you the results you want and are paying for. Worse yet, if YOU don’t understand this, you may think the laser treatments aren’t working and quit before you should. Taking it one step further, the length of anagen phase differs depending on where the hair is. For example, the anagen phase of a facial hair follicle is much shorter than that of a leg hair follicle (who knew?) Again, why is this important to know? If your provider doesn’t know this, then they can’t correctly predict the time interval between your treatment sessions. And this means you’re going to pay for something that won’t be effective. Unlike treatments that just pull the hair out (waxing, plucking, epilating) or remove it at the surface (shaving, depilatories), laser hair removal is a process that targets the pigment, or melanin, in the hair follicle. Most of our unwanted hair is dark (that’s why we don’t like it!) Melanin is the pigment in the follicle that gives it color. It is found at the follicle’s base, near its blood supply. There are a few different lasers that treat unwanted hair growth. Each of them is a little different in wavelength, which means they penetrate the skin at different depths. But all of the lasers are the same in that melanin is their target. So when the laser is fired, it zeroes in on that follicular melanin and that is what absorbs the energy. This produces a very specific, heat-driven or thermal injury at the base of the follicle that disrupts and damages the blood supply. Guess what the end result is? No blood supply means no hair! So unlike those other treatments (that you have to continue spending money on to keep the hair away), laser hair removal offers you permanent removal of your unwanted hair. Most patients will see a 75-95% reduction in hair over a series of 6-8 treatments. Why not 100%? Because some of our hair follicles don’t have much melanin. Remember, that’s the target that the laser “sees” in the skin. This type of hair is usually very fine and light. There really isn’t any effective laser treatment for getting rid of it yet, but there are some cool, new things in the works, so stay tuned. Most people aren’t really bothered by this type of hair the way they are by the darker, coarser hairs, which are the most responsive to laser hair removal treatment. One of the most frustrating things in life is to pay for something that you immediately break, lose or that just doesn’t work. While many people out there offering laser hair removal make big promises, and offer unbelievable, rock bottom pricing, you have to ask yourself, “does this sounds too good to be true?” Listen to your gut, because you’re right, it probably is! Treatment plans for laser hair removal are not a one-size-fits-all thing. Not all hair is created equal! The one promise Celibre Medical will make to you is that we can offer you the latest, most state-of-the-art technology in laser hair removal, and these devices are in the hands of the most experienced, knowledgeable and capable people in the business. We’ll proudly tell you that we have over 30 years of experience and have performed 75,000 laser hair removal treatments in the past five years alone. We lead the industry. Now, that should make you feel comfortable in and of itself, but let us also tell you that we treat all kinds of people who want to get rid of unwanted hair for all kinds of reasons! Whether you’re a man or a woman, fair skinned or African-American, just past puberty or in menopause, on a medication that’s made hair grow where you’ve never had it before, or are just sick and tired of shaving everyday, we’ve got a laser hair removal treatment plan that’s perfect for you! Experience and knowledge do matter when it comes to laser hair removal, because there are SO many factors that need to be considered when deciding what device and how often to use it and for how long. It is not one-size-fits-all! Yes, you want results, but you also want to ensure you’re treated safely. There are permanent, potentially scarring side effects when these lasers are not used correctly or the wrong laser is used on the wrong person. At Celibre Medical, we take into account each person’s unique characteristics and medical history when formulating a treatment plan in our laser hair removal process. Our program is very individualized and tailored just for you. Please give us a call today if you’d like to know more about how we can help you get rid of your unwanted hair once and for all. Facial Laser Hair Removal – A cosmetic procedure that is commonly performed at Celibre Medical. It is safe, effective, and the lasers used are all FDA approved. 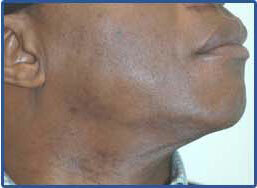 Facial laser hair removal most commonly involves treatments for the chin or the upper lip. When compared with alternative methods of hair removal, such as waxing or electrolysis, laser hair removal quickly emerges as a superior option based on total cost and permanence. Using a laser to get rid of unwanted facial hair is quicker, easier, permanent and more comfortable than the alternatives. In fact, the procedure can be completed in as little as 10 minutes per treatment. 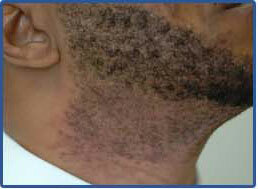 At Celibre Medical, we can treat all facial areas, from sideburns to upper lip, to chin or neck. Moreover, a patient is not required to allow the hair to grow prior to receiving treatment as is the case with waxing. And because we use over 20 different FDA approved lasers, we can customize a facial hair removal solution to your specific needs, skin type and hair type. This customized approach yields safer, more permanent results with fewer laser hair removal treatments. Body Laser Hair Removal – Is excessive back hair, chest hair, abdominal hair, neck hair, ingrown hair, pubic hair, or underarm hair preventing you from being your best? Laser hair removal is a great way to permanently get rid of unwanted hair anywhere on your body. In addition to saving money over the long run, laser body hair removal is a time saving process when compared to shaving or waxing. Each laser hair removal treatment is customized to your specific skin type and area of the body using one of several different FDA-approved lasers. Arm Laser Hair Removal – If you’re bothered by the presence of dark hair on your arms, know that laser arm hair removal offers an easy, permanent solution to your problem. Our FDA-approved, state of the art lasers are able to permanently remove arm hair, regardless of your skin type. Terminal hair, which is a name for unusually thick or dark arm hair, can be removed using our advanced laser technology. Treatments are quick and easy, and when compared to repeated, costly, and painful waxing alternatives, our patients have made an easy choice! Bikini Line Laser Hair Removal – It is difficult to appear confident at the beach without having to worry about embarrassing shaving bumps or stray hairs. After your bikini laser hair removal treatment is complete, you will find that the painful shaving bumps and razor burn will disappear, and worrying about ingrown hairs will also be a thing of the past. Celibre Medical offers a permanent solution to bikini line hair removal. Our FDA-approved lasers are safe and effective for all skin types. And they don’t take a long time – some procedures take as little as 10 minutes to complete. Eyebrow Laser Hair Removal – The treatment of a “uni-brow” is one of the most commonly requested laser facial hair removal treatments. This condition, which can affect both men and women, has traditionally been treated with tweezing, threading or waxing. These painful alternatives require timely, ongoing maintenance and also have negative potential side effects such as acne, darkening of the skin and infection. By opting for eyebrow laser hair removal, you will no longer have to concern yourself with excess brow hair. It is a quick, permanent solution that will keep you looking your best and only takes about 15 minutes. After completing a treatment, you may experience very slight irritation in the area where hair was removed. The sensation is similar to that of a sunburn, and usually resolves within 24 hours. Leg Laser Hair Removal – Laser leg hair removal treatments will not only save you money over ongoing waxing treatments but it will save you valuable time (it is said that women spend nearly 60 hours per year on shaving their legs alone). And the added benefit is that you will never have to pack your shaving materials in your travel suitcase again!